It’s new-brands-at-Audiosupport season! Please meet Fret-King that was raised by the legendary Trev Wilkinson to become a fair, wise and just ruler of strings. But what does that actually mean? Well, decades of listening to guitar players’ needs taught them that while they had some great ideas, the true goals of the guitar players out there had to become their goals too. With a design team led by the legendary Trev Wilkinson, they use their knowledge positively; they have a determination to produce guitars with flair, and creative innovations that give you an amazing, tactile and emotional guitar-playing experience. And the dedicated people under the wings of the Fret-King really love what they do, which means that they create their instruments with a passion. Trev Wilkinson’s decades of guitar-building expertise and unrivaled guitar hardware and pickup know-how means that they can go where other guitar makers don’t dare to enter, using innovative, meticulous construction methods and premium materials and components throughout the whole building and finishing process. The open-minded approach makes Fret-King think outside the usual constraints while keeping a close eye on the styling cues we are all comfortable with, and the classic tones every guitarist enjoys to produce guitars that feels like you’ve played them all your life. Part of the Black Label design brief was to actually listen to pro players, and to work with them to create their ideal guitar. Hugely experienced players like Jerry Donahue, Dave ‘Bucket’ Colwell, Gordon Giltrap, John Verity and Geoff Whitehorn – all players who have definitely paid their dues and reflect a huge variety of styles. 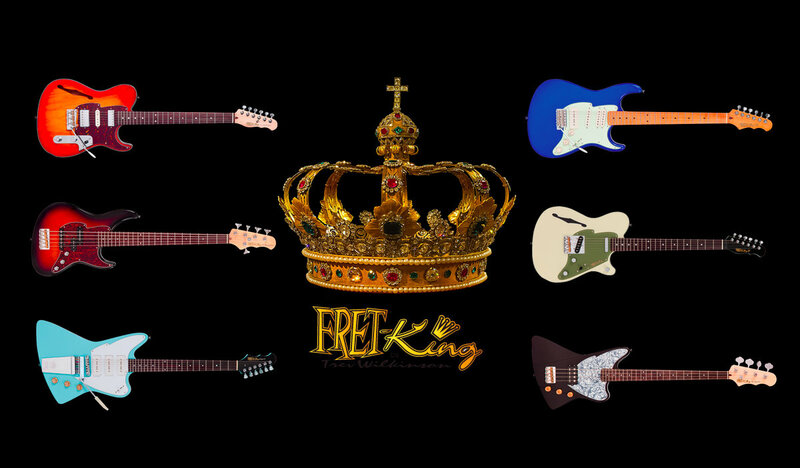 As well as being great players, they know a thing or two about guitars and have collaborated with Fret-King to create a series of artist-inspired guitars featuring attributes that all players will find valuable, useful, and above all, musical. Because you deserve the best, with no compromise, Black Label takes a fresh view of how to integrate real custom shop high-end features, giving you the advantages offered from instruments designed to be professional working tools. These beauties face up squarely to the acknowledged benchmark. With peerless classic looks, enhanced ergonomics and its sophisticated tonal palette, the Eclat is many guitars rolled in to one. A magical fusion of the familiar, with contemporary, yet subtle dynamic improvements, and tone circuitry which takes this familiar body style into new territory while sticking like glue to its heart and soul. A body style debuting with the new Fret-King Black Label, nods towards a guitar heritage that spans all musical styles.The Elise features a chambered mahogany body, solid maple cap, and Fret-King’s signature ‘Vari-Coil’™ tone circuitry a for a breath-taking breadth of tone. Corona, a ‘moniker’ associated with high end, UK-built Fret-King guitars for two decades, recognizes the roots of the double cut, as refined by Fret-King. The Black Label Corona blends masterbuilt qualities, classic and contemporary tone, great feel, and, of course, that Wilkinson trademark, a vibrato with unrivaled return to pitch whether you play like your guitar is in the shadows or covered in criss-cross black tape. Super-hybrid illustrates Trev’s radical/sensible/useable ethic; 24 frets and sharp cutaways for speed-driven shredding, hardtail for ultimate tonal coupling, Hum/Single/Hum and ‘Vari-coil’™ for a million tones. Oh, want to play acoustic too? No problem, just kick in the ‘Acoustibridge’™. Perception is a bass for real bass players and a name synonymous with benchmark bass quality. The Black Label Perception four and five string basses have those Fret-King bass hallmarks; unshakeable journeyman bass player feel, perfect balance, high access necks, comfort-contoured body and distinctive, instantly recognizable, rock-solid tone. In short, Fret-King’s Black Label moves forward in the footsteps of history!